Considered the most significant recent agrarian movement in Mexico, the 1994 EZLN uprising by the indigenous peasantry of Chiapas attracted world attention. Timed to coincide with the signing of the NAFTA agreement, the Zapatista Army of National Liberation reasserted the value of indigenous culture and opposed the spread of neo-liberalism associated with globalization. 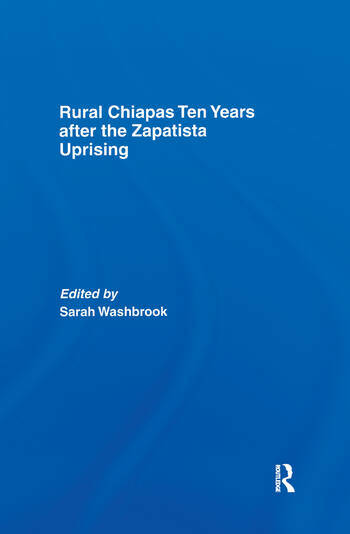 The essays in this collection examine the background to the 1994 uprising, together with the reasons for this, and also the developments in Chiapas and Mexico in the years since. Among the issues covered are the history of land reform in the region, the role of peasant and religious organizations in constructing a new politics of identity, the participation in the rebellion of indigenous women and changing gender relations, plus the impact of the Zapatistas on Mexican democracy. The international group of scholars contributing to the volume include Sarah Washbrook, George and Jane Collier, Antonio García de León, Daniel Villafuerte Solís, Gemma van der Haar, Mercedes Olivera, Marco Estrada Saavedra, Heidi Moksnes, Neil Harvey, and Tom Brass. This book was previously published as a special issue of The Journal of Peasant Studies.